I got to spend some time with little Katherine today in the studio to celebrate her first birthday. I took her photos back before Christmas and she is now mobile and very much on the move! 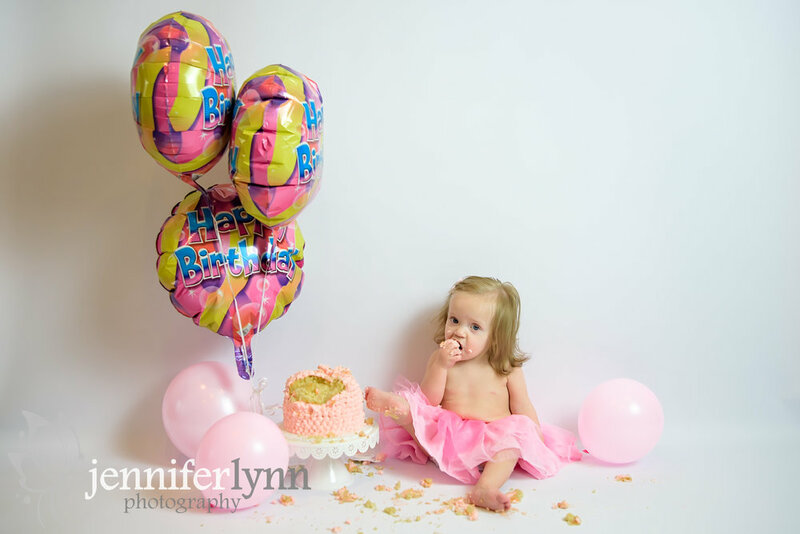 We got some super cute photos today of her all dressed up before her cake smash. And while I was prepared with some props and chairs, the only thing that mattered to Katherine was the balloons. She loved chasing them around and, later, licking cake and icing off of them. And she was the first to sit in my new "big kid chair" and I must say, I love those photos! Her mom made a super gorgeous cake for the cake smash and I was so impressed at how beautiful it was. My cakes never look that good so I just slather on the icing however works best as I know I'm just going to eat it. But Katherine loved her cake and my favorite photos are of her putting her feet up on the cake stand. Later she decided that balloons were once again more fun than cake, so we finished up with a messy little girl chasing balloons. I'd say her first official cake smash and birthday photos were a success. Thanks for letting me take these special photos and let me be one of the first to wish Miss Katherine a very happy first birthday! Thinking of booking a session for your child or baby? It's never too early or too late, especially to make sure you preserve all those memories of baby's first year! Contact me today to book your session and ask about my baby milestone package for all of baby's first year.